Through the Resident Development Program, we aim to help ourselves and other residents develop our leadership skills and gain better understanding of our core values, strengths, and goals. The Leadership Development Program for faculty has seen success since its establishment in 2011. Since its outset, a handful of residents have had the opportunity to participate in each cycle. As we learned from experts and reflected on our experiences during the first three years of clinical training, we gained more awareness of ourselves and how we interacted with others. If we could learn to tap into our personal purpose and recognize our own deficits, perhaps we could have mitigated the burnout we felt during our clinical years. The same question kept coming to mind – why should such personal development wait until we are faculty? Practice forms habit, and habits can be hard to break. Complementary programs dedicated to resident development did not exist at our institution or for widespread use. We felt driven to create a program for surgery residents for personal development and leadership training. 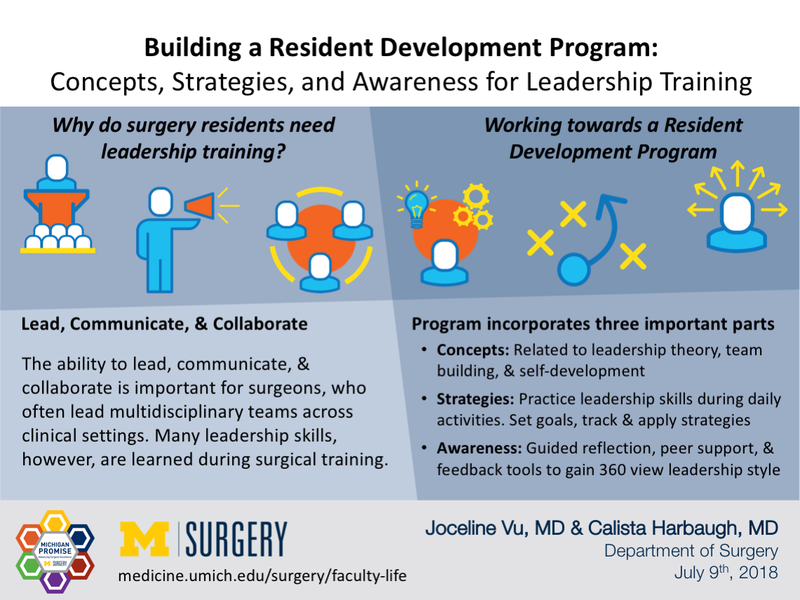 Why do surgery residents need leadership training? The ability to lead, communicate, and collaborate is important for surgeons, who often lead multidisciplinary teams across clinical settings. Many leadership skills, however, are learned during surgical training. With the start of July, surgery interns across the country were placed into an unfamiliar role in the hierarchy: new doctors working with nurses and advanced practice providers, many of whom have far more clinical experience than they do. Over the years of training, residents must rise to new leadership roles: the consult resident who interfaces with other specialties, representing their attending and the department, the senior resident who helps lead the team under the chief resident while craving autonomy. Even during the most mundane of daily tasks—morning rounds—the chief resident balances patient care with maintaining a productive team dynamic and educating junior learners. It is well-established that leadership skills can be trained over time, but in surgical residency this process is more haphazard than intentional. Through interviews with residents from our program, we learned that residents develop their leadership skills primarily through trial-and-error and from role models. Additionally, leadership-specific feedback is scarce, leaving residents to rely on informal interpersonal cues to modify their performance. Finally, there is a preconceived bias that residents should “trust the system” to learn to be effective leaders. Contrast this with how residents learn clinical judgment or how to operate—there is a wealth of resources aimed to train residents in medical knowledge and technical skills, and residents receive regular and specific feedback about their performance. Experiential learning through repeated exposure alone is not sufficient for these two domains, and it should not suffice for learning important leadership skills. Despite the need, the constraints of surgery training cannot be ignored, and any effort to form a leadership training program must address these barriers to succeed. Among these is a cultural barrier: in surgery, clinical competence is paramount, and residents who exhibit poor interpersonal skills may have these issues unaddressed if they have good clinical skills. Even worse, residents may celebrate bad behavior in the name of patient care, perpetuating detrimental surgical stereotypes. Another pragmatic but important barrier is the conflicting educational priorities of residency. As work hours are restricted and educational demands increase, there remains little time to dedicate toward leadership. Self-development requires time for reflection and emotional vulnerability to recognize and accept one’s areas for improvement—both in scarce supply for the tired surgery resident. Finally, the difficulties in obtaining good feedback about leadership are not isolated to residency. Constructive criticism of one’s interpersonal skills can be difficult to swallow, and discomfort with giving and taking feedback leads to residents being unaware of their own deficiencies. 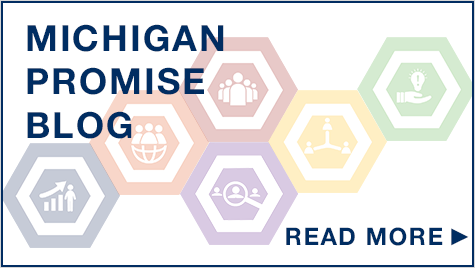 Through the support and investment of the Michigan Promise, we have created a program for residents that incorporates three important parts. In interactive sessions facilitated by department leaders and other experts, residents will learn concepts related to leadership theory, team building, and self-development. These will serve as a framework for thinking about how they act as leaders in the hospital. These sessions will occur during protected educational time, avoiding scheduling burden and conflicting clinical responsibilities. Through case-based discussion, residents will generate strategies to practice their leadership skills during daily activities. Theory is important, insomuch as it is applied into practice. The program will encourage residents to set goals and keep track of their effectiveness, encouraging use of these strategies in real-time. Finally, this program will teach residents to master awareness of self and others within diverse teams. Leadership performance feedback surrounds us but often remains hidden and unstated.  Using guided reflection, peer support, and enhanced feedback tools, residents will gain a 360° view of their leadership styles, strengths, and areas for improvement within the context of their current and future leadership performance. We hope to establish a sustainable and agile educational program that is tailored to surgery residents. Through the Resident Development Program, we aim to help ourselves and other residents develop our leadership skills and gain better understanding of our core values, strengths, and goals.